A vinyl fence is a generally maintenance-free option, but keeping it clean should always be a priority. While vinyl fences are loved for being virtually maintenance-free, that doesn’t mean that you can get away with never washing or cleaning your vinyl fence! Thankfully, vinyl fences are very easy to clean and keep looking great for many years. 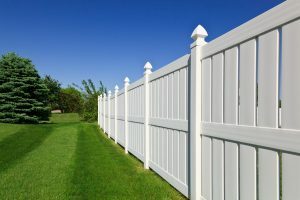 Here are our favorite simple tips to help you clean your vinyl fence and maintain the investment that you made. First, start the process by washing off any loose debris. Loose debris can include things like dead leaves and clumps of grass from mowing the lawn. Use a garden hose and a brush to wash off all of this loose debris. Use the brush to sweep away anything else so that you can see what is beneath. This initial cleaning step is a great way to see if there are other problems lurking on the surface of your vinyl fence. Are there spots that are hard to get off? Use a household cleaning solution designed for use on vinyl fences. Mix it according to package instructions and use the same brush to scrub it on. Most of these solutions require you to place it on the surface of the vinyl fence and let it soak in for a few minutes. Next, scrub with a soft brush and wipe it clean. If there are still tough spots lingering on your vinyl fence, use a small amount of bleach diluted in water. Always test this solution on a small, unnoticeable patch of your fence before using it over the entire fence. Do you have stuck on messes like tar or paint? Use a plastic tool to chip them away. Whenever possible, use a soft brush to avoid doing damage to the fence. This entry was posted on Friday, June 23rd, 2017 at 2:17 pm. Both comments and pings are currently closed.